Fredrik Dehli, a business developer, at Oslo Business Forum. Oslo Business Forum, part of Oslo Innovation Week, will be presenting a conference on the Future of Technology and Sustainability, at which former U.S. President Barack Obama will speak. The 12th Oslo Innovation Week takes place Sept. 24-28, an event that sets real business solutions to the United Nations sustainable development goals. In one week, more than 50 events take place at one of Europe’s premier tech startup investor events. All are organized by different networks, private and public organizations. Last year, 11,000 visitors attended some 53 events. Startups and entrepreneurs with global potential, investors and corporates, and cutting-edge scientists will gather up north to learn from each other, get inspired, and make things happen. The Oslo Business Forum is presenting the Future of Technology and Sustainability conference on Sept. 26, Norway’s largest technology and management conference. (InnoMag is the media partner of the OBF conference.) Among the speakers during the conference will be former U.S. President Barack Obama. The city is looking for people who have a solution to solve a global challenge. They welcome entrepreneurs, executives, game changers, and investors to come to Innovation Week. According to the invitation, there will be 100 pitches connecting the most promising seed-stage startups from the Nordics with investors. This is a competition. Last year, the contest attracted over 100 startups in the entry rounds pitching for a spot among the final 10. The pitches will take place in Norway’s major cities. Eligible startups should this year be able to create business solutions to the UN 17 sustainable development goals. Each pitch should take three minutes plus two minutes for questions and answers. All presentations should be in English. The winner is awarded NOK 300,000, sponsored by Norway’s largest bank DNB. Oslo is working to raise the number of startups with international potential, combining startup support services with international profiling and regional business development. Last year, the city set out to create a unified strategy for its Smart City efforts. The regional office has followed up with a smart city that sets entrepreneurs and startups as the essential part. Oslo has done this through initiating the world’s first Smart City accelerator connecting startups and the municipality, further putting focus on smart climate solutions. There was also an electric mobility car race that showcased the opportunities within the future of transport. 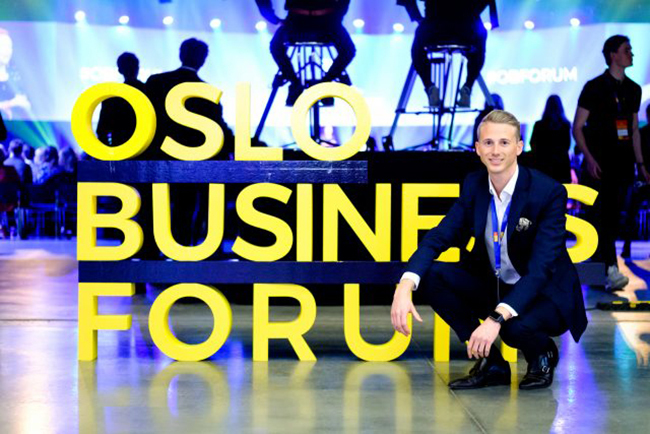 “We want to lift Norwegian startups by creating an arena where they get the opportunity to meet decision makers who can turn out to be their first customer.” says business developer at Oslo Business Forum, Fredrik C. Paulshus Dehli about the OBF conference, which contributes to these goals. “In addition, they will be able to meet investors, market their products and services, and expand their network. Oslo Innovation Week is owned by the City of Oslo and Innovation Norway, and Oslo Business Region is project manager. Back in 2013, The Economist stated that the Nordic region is becoming a hothouse of entrepreneurship, with 15,000 new companies born every year in Oslo. Various co-working and innovation hubs are popping up. Oslo is also collaborating with Austin, Texas, and Hackney, London, through Creative Cities Alliances. At the Future of Technology and Sustainability Conference, startup companies will have the opportunity to meet approximately 3,000 participants, primarily leaders and managers. It will take place at the newly renovated conference center, X Meeting Point, at Hellerudsletta. According to the OBF website, 34.6 percent of the conference attendees are CEOs or chairpeople in their companies. 1. How can you utilize technology to create sustainable business models? 2. What big sustainable issues should you pay attention to this year? 3. How can you innovate to meet the new requirements of the new economy? 4. How can you build a sustainable business model that addresses the challenges of industry 4.0? MIT professor and world-renowned IT expert Andrew McAfee, CNN reporter and anchor of Quest Mean Business Richard Quest, NHH researchers on innovative business models Sveinung Jørgensen and Lars Jacob Tynes Pedersen, tech expert Silvija Seres, and Nordea senior adviser Thina Saltvedt, who will provide perspectives on developments in sustainable finance, are among the list of confirmed speakers. The forum provides organized networking where follow-up meetings can be scheduled; participation in intimate roundtable discussions with keynote speakers; debates on one of three stages; and interactive workshops. Information about Oslo Innovation Week was written by Rasmus Falck. The article about Oslo Business Forum’s conference originally appeared in Norwegian on Aug. 2 at innomag.no (www.innomag.no/oslo-business-forum-bygger-ny-startup-village-gjelder-forstemann-til-molla-prinsippet), with additional information from the Oslo Business Forum conference website. (reg.obforum.no).